Many people around the country were watching the Eagles win against the Patriots in Super Bowl LII Sunday night, including WWE superstars. Several stars already had allegiances to specific teams playing in the big game while others simply enjoyed the entertainment of it all. A few superstars may have been heartbroken over the loss but most seemed to give credit where it was due, to the underdogs. 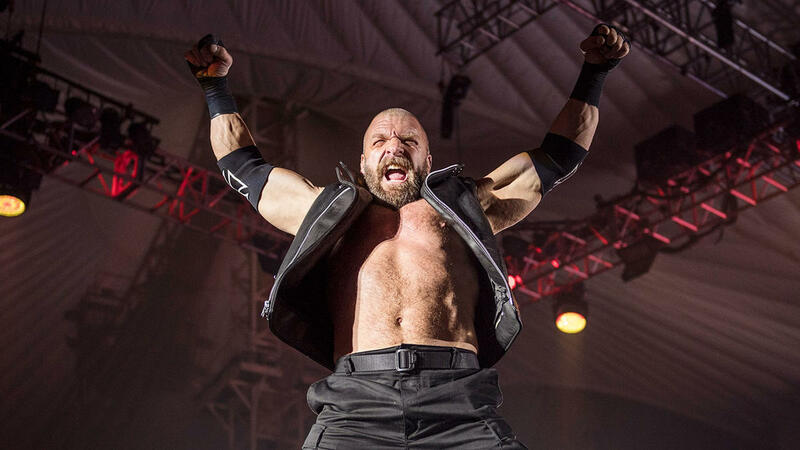 Among those who offered congrats were current WWE Champion AJ Styles, as well as former champions John Cena and Triple H.
In a report on Monday from WrestleZone, it’s noted that WWE star Triple H offered his congratulations in a special tweet with a photo included. “The Game” has been known to send out a special gift to winning teams or athletes in a variety of sports ranging from baseball to basketball to F1 racing. That trend will be no different for the Philadelphia Eagles, as Triple H showed off the special championship belt that the team will receive from the WWE for their Super Bowl victory. The image (below) shows off a WWE Championship belt complete with the Eagles side plates. Triple H also included a special congratulatory message quoting the Eagles’ star Zach Ertz. In addition to “The Game” plenty of other WWE superstars were on Twitter to give their thoughts once the final score became official. John Cena, who hails from the New England Patriots’ home state and is a fan, was humble in his response, saying the following. In a humorous tweet, SmackDown Live heel Kevin Owens tweeted what he enjoyed most about the game. It’s clear from his response he may not be the biggest American football fan as he hails from Canada, but he still found some enjoyment in part of the game and one of the teams. In another tweet, Rob Gronkowski’s good friend Mojo Rawley congratulated the winners as well as “Gronk” on his effort in the big game. However, the “Modern Day Maharaja” Jinder Mahal took it to another level, suggesting that maybe Gronk’s team was cursed after the Patriots star messed with him at WrestleMania. Other superstars who offered congratulations included United States Champion Bobby Roode who called it a “glorious” win by the Eagles. AJ Styles, Maria Kanellis, Drew Gulak, Johnny Gargano, Tye Dillinger, and Lilian Garcia. WWE SmackDown Live Women’s Champion Charlotte Flair sent out a tweet of a photo showing off a special Eagles robe. While most of the WWE superstars seemed to offer praise and congratulations for the Philadelphia Eagles’ underdog victory, at least one heel superstar showed her frustration over the outcome. “Ms. Money in the Bank” Carmella just so happens to be a former New England Patriots cheerleader, but didn’t cheer on her team quite enough this time to get the victory.